For DPF faults the best solution is to have the Diesel Particulate Filter (DPF) completely removed. For more information on this, check out our dedicated DPF Removals article. The ABS Pump fitted to later models of the Volkswagen (VW) Touran is a MK60 ATE (Teves) pump. They are mounted in the engine bay (nearside, behind the battery tray & against the suspension turret). 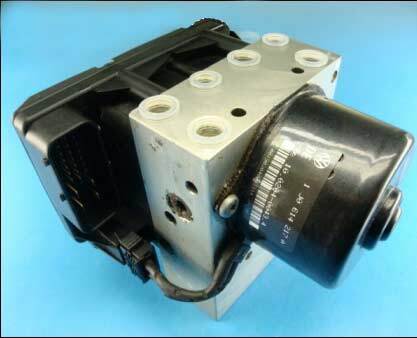 The problem with these MK60 ATE (Teves) pumps is that ATE decided that for space-saving, it would be a good idea to have the conventional brake pressure sensor fitted internally, which is normally mounted externally to the pump closer to the brake servo. It is very rare for a brake pressure sensor to fail on conventional systems, however, these new MK60 ATE pumps are failing rapidly and we’re currently seeing 10 or so units coming in for repairs & modifications on a daily basis. Below you’ll see a list of the most common symptoms which suggest you have the ESP fault relating to a failure of the Brake Pressure Sensor / Sender Switch. You may have all the symptoms or even just one. Unlike other companies who will simply repair the pump using a like-for-like brake pressure sensor and simply replace the damaged parts. We carry out a full test on the unit and during the repairs, we modify these pumps to meet & exceed the OE specification and ensure that the manufacturing defective part is eradicated from the current pump design. Functionality will remain the same and no modifications will be required during fitting. No, as far as we are aware we are the only company in the whole of Europe that offer this specialist modification. There have been rumours of people and/or companies trying to repair these units and in some cases imitate our work. Please understand that although the ESP system is not absolutely crucial, modifying the ABS controller/pump in any way (without superior extensive knowledge) in the technology of advanced braking systems and electronic control modules, you will be risking the life of others. Please do not attempt to repair these units yourself and please do not offer such services to trade or the general public. We have been in business since 1972 as a group company and all our parts, services are fully tested before leaving the workshop. All units are thoroughly tested on specific specialist equipment to ensure maximum quality. Our ESP Fault Modifications come fully approved and as far as we’re aware, there is no other company out there that can successfully repair these units and completely remove the defective state. Can You Offer A Replacement Off The Shelf? 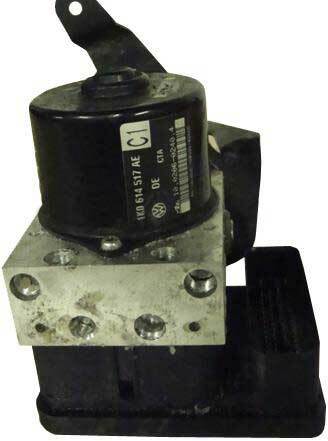 Due to the very common failure of these units, we now carry these ABS units with the external modification in stock. To see if we’ve got the part matching your vehicle, give us a call on 0871 2887 666 or email us with the part number from your ABS pump. The part number you’re looking for will be located on a sticker on the pump and it will start with 1KO for example: 1KO614517M (The M may be either 1 or 2 letters and can vary). We need that part number from your unit to verify if we’ve got one in stock. If we haven’t, then we can always work on your own unit and carry out the repairs & modifications on your unit. Can I Fit The ABS Pump Myself? Although it’s not the hardest of jobs, we do advise that you have a professional & qualified mechanic fit the ABS pump. After all, it is directly associated with the braking system and so it is for your own and others safety that the ABS pump is fitted correctly to ensure the braking system works correctly as it should. After re-fitting this part, you will need to bleed all four brake callipers and the ABS pump will also require bleeding. We do offer a very competitive fitting service and can guarantee to beat all quotes (with programming & recalibration inclusive). For an instant quote, call us on 0871 2887 666. Will I Need To Have It Re-Programmed? Yes, 9/10 times the ABS pump will need reprogramming and have all associated sensors (wheel speed sensor, steering angle sensor, brake pressure sensor & lateral acceleration sensor etc) will all need to be recalibrated. This can be done using a VAGCOM diagnostics system. Not all mechanics have access to this and so they may need to call a 3rd party auto-electrician in to do this, we do offer full step-by-step instructions for the programming & recalibration of the unit. UPDATE – Our latest on the shelf units will NOT require programming and are fully self-calibrating! Can Sinspeed Fit This Part For Me? Yes, we do offer a very competitive fitting service and can guarantee to beat all quotes (with programming & recalibration inclusive). For an instant quote, call us on 0871 2887 666. Can Sinspeed Collect My Vehicle & Drop It Back To Me? Yes, we operate a FREE collect & return service (dependant on your location) and even if you’re out of our reach, we will still offer to collect your vehicle at a very affordable rate. We have gone as far as 400 miles to collect customers vehicles and with the collect & return charge inclusive, we still manage to beat other dealers & garage quotes on the complete job. So give us a call today on 0871 2887 666 and see what we can do for you. We now offer a full LIFETIME warranty on all parts. If the part fails, we will replace it right away for you absolutely free. However, we’ve been operating these ABS modifications for many years and never yet had a warranty claim for the Brake Pressure Sensor faults. We’re confident that our modification is a permanent fix for this common failure. No other company in the whole of Europe can offer this same modification at this high level of quality and back it with a LIFETIME warranty as we do. We use only the highest quality parts to meet & exceed OE specifications. We work on all vehicles, if you’ve got a car with a Brake Pressure Sensor fault relating to the ABS unit or have the ESP light lit up on your dash, then call us today and we’ll give you an instant quote. The number to call is 0844 847 9999. Tags : (06/05-06/10) VW Touran (1T1) ABS Pumps Repaired, (06/05-06/10) VW Touran (1T1) Exchange ABS Pumps In Stock, 00005305H0 ABS Pump For VW Touran, 10-0206-0240-4, 10-0960-0359-3, 10.0206-0240.4 ABS Pumps, 10.0960-0359.3 ABS Pumps, 1K0 614 517 AE ABS Pumps, 1K0 907 375 AC ABS Pumps, 1K0 907 379 AC VW Touran ABS Pumps, 1K0-614-517-AE, 1K0-907-375-AC, 1K0-907-379-AC, 1K0614517-AE, 1K0907375-AC, 1K0907379-AC, 1K0907379AC, 1KO 614 517 AE ABS Pumps, 1KO 907 375 AC ABS Pumps, 1KO 907 379 AC ABS Pumps, 1KO-614-517-AE, 1KO-907-375-AC, 1KO-907-379-AC, 1KO614517-AE, 1KO907375-AC, 1KO907379-AC, Help with my vw touran abs pump, how to fix abs pumps, how to fix vw touran esp fault, repairing brake pressure sensor fault for vw touran, repairing esp fault for vw touran, Volkswagen (VW) Touran 01435 ABS ESP Fault Repairs - Call 0871 2887 666 Today!, Volkswagen (VW) Touran 1K0614517AE, Volkswagen (VW) Touran 1K0614517AE / Ate 10.0206-0240.4 ABS Pumps, Volkswagen (VW) Touran 1K0907379AC / Ate 10.0960-0359.3 ABS Pumps, Volkswagen (VW) Touran ABS Pumps In Stock, Volkswagen (VW) Touran ABS Repairs, Volkswagen (VW) Touran Brake Pressure Sender Switch Sensor (ESP) Fault Repairs, Volkswagen (VW) Touran Brake Pressure Sensor (ESP) Fault Repairs, Volkswagen (VW) Touran ESP Fault ABS Pumps Exchanged, Volkswagen (VW) Touran ESP Fault G201 ABS Repairs, Volkswagen (VW) Touran ESP Fault G201 ABS Repairs - Call 0871 2887 666 Today!, Volkswagen (VW) Touran MK60 ATE (Teves) ABS ESP Fault Repairs, Volkswagen Touran 10096003593, VW Touran 10020602404, VW Touran 1K0907375AC, VW Touran 1KO614517AE, VW Touran 1KO907375AC, VW Touran 1KO907379AC, vw touran abs repairs, vw touran esp fault, vw touran esp fault repairs, vw touran esp faults. We need to know the vehicle details. Please call our office on 0844 847 9999 or alternatively send us an email. I have to Iran 1.9 tDI SE 2005 Model.on dash board the traction control light is ON and EPS light is also on. Could you please send me a quote for the part and labour and how long it take to repair. Price on unit and shipping to norway? We’ve sent you an email with full pricing and information. 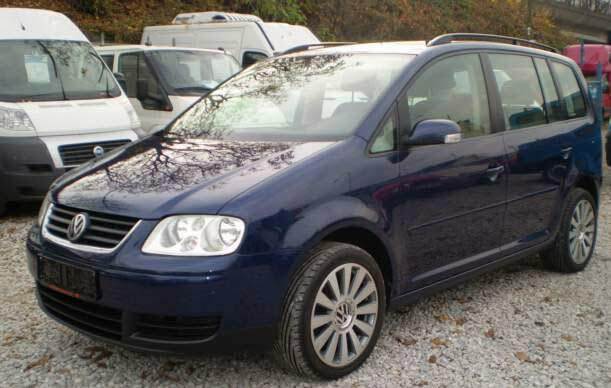 Hi I have a VW Touran 1.6 TDI Reg jan 2011 with the Symptoms of a failed abs / esp unit as your Description above. would you be able to repair this for me under your fitting service, and how much would this cost. Thanks for the enquiry, and many apologies for the delay in our response. We can definitely get this sorted for you. We’ve sent you an email over now with full pricing and further information regarding our repair options. I have a VW Touran 1.9 diesel with the abs and esp warning light on, could you quote this same problem for me? I don’t think this will be the Brake Pressure Sensor fault because normally that will just cause the ESP light to be illuminated on the dash, not the ABS light as well. However, we’ve sent you an email with full pricing and information for testing and repairing the ABS unit if it is faulty. It’s an extremely common fault and can definitely be repaired. Due to the popularity of this product, we carry remanufactured units in stock ready to go as a direct fit for your old part. We’ve sent you an email with full pricing and information. I have a VW Touran 2006 & abs & esp light are on constant. I have fault code G201. Can you give me a price to sort this please & where you are based.